Travelling by air has never been made so simple and airplane is the most popular means of transportation that brings tourist to Vietnam. Similar things can be said for tourists who would like to move from one to another destinations within the country. Vietnam is served by three main international airports: Noi Bai International Airport (HAN), Tan Son Nhat International Airport (SGN) and Da Nang International Airport (DAD) located in Hanoi, Ho Chi Minh City and Da Nang respectively. There are also provincial airports in major attractions such as Dalat Airport, Nha Trang Airport and Dien Bien Phu Airport. 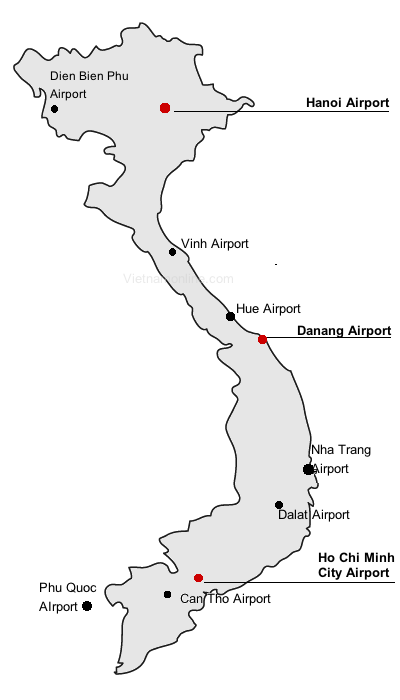 The size of each airport is relatively small, even those in Hanoi and Ho Chi Minh City, compared with other international airports in the region. The service is getting to the standard but there is still space for improvement, especially in terms of hygienic issues. Each airport is equipped with food services and dotted with souvenirs shop and money exchange stalls. On the flip size, because of the manageable size, you will easily find your way around the airport without being afraid of getting lost or being late for your flight.